Argentina is built for road trips. The distances are long and the landscapes breathtaking. And there is no shortage of scenic drives here, like the Quebrada de las Conchas in the north. The Ruta de los 7 Lagos in northern Patagonia is one of these iconic routes. It connects the two mountain towns of Villa la Angostura and San Martín de los Andes. This is Argentina’s lake district. It’s just north of the more well-known city of Bariloche. The name of the route may be the Seven Lakes Route, but there are a lot more than seven lakes to explore. If you’re like me, you’ll want to tick off each of the official 7 lakes to satisfy to some unknown authority that you did it, you collected them all. But don’t limit yourself to the official list. My favorite lakes weren’t part of the official seven. The “official” list of the lakes that make up the Ruta de los Siete Lagos differs depending on the source. This is the list I saw the most and its’ the one I’ll use in this post as the official seven lakes. They are listed here north to south, starting in San Martin de los Andes and ending in Villa la Angostura. There are more lakes than even this, but these are the ones we visited and that are mentioned in this post. These four lakes are also coincidentally my favorites! 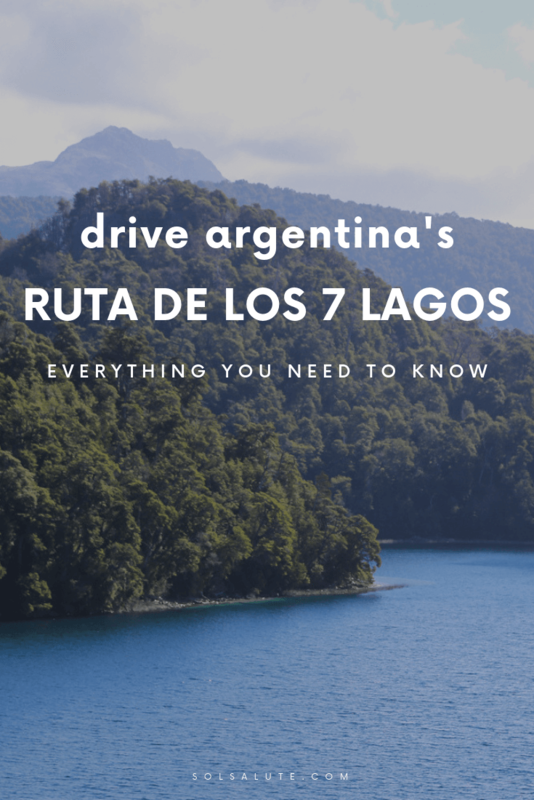 Argentina’s Seven Lakes Route is on the famous Ruta 40 highway. This highway runs the entire length of the country from north to south. This short section is paved and in excellent condition. The roads leading to other lakes (like Lago Traful and Lago Hermoso) are dirt roads but are in good condition as well. We rented a car for our time in San Martin de los Andes and I highly recommend it. While car rentals in Argentina are far from cheap, having the freedom to move is worth every penny. Guided tours allow you limited time at each viewpoint, but with a car we could go where we wanted, when we wanted. You can rent your car in any of the cities near the 7 lakes: Bariloche, Villa la Angostura, or San Martin de los Andes. There is no need to rent a large truck or 4x4. We had no issues with the tiniest and cheapest rental car category. I recommend reserving your car in advance, the will sell out in high season and may very well run out of cars in shoulder season as well. Check avilability and rates here. If you'd rather not drive, there are guided tours that will take you along the entire Camino de los Siete Lagos route. The tours below depart from Bariloche and include time at each of the viewpoints and time in both Villa la Angostura and San Martin de los Andes. This tour is the most affordable option but please note that it's only in Spanish. It departs from Bariloche, stopping in Villa La Angostura and San Martin de los Andes for lunch. Reserve here. This tour is highly rated and, importantly, is bilingual. If you only speak English, I recommend spending a little more for the luxury of understanding your guide. Reserve here. Below is a map of all of the lakes we stopped at, 11 in total. The other pin points mark the viewpoints, but don’t stress too much about missing them. They are very well marked on the road. You’ll see them all! We had based ourselves in San Martin de los Andes, which lies at the northern end of the Seven Lakes Route. So we drove this route from north to south. We drove to Villa la Angostura and back, with long stops at a few of the lakes and a lunch break in Villa Traful. We had a leisurely start to our day, leaving at 10 am and got back to San Martin de los Andes just in time for sunset at 7 pm. If you have time constraints, it can be done in a lot less time if you don’t detour off the main highway. Lago Lácar isn’t an official lake, but its beauty and accessibility should qualify it for the unofficial 8th lake. San Martin de los Andes is built right on the lake, so you can access the beach and pier right from downtown. There is a parking lot behind the park that borders the beach. These first few kilometers of the 7 lakes road have great views of the lake and San Martin below. The photo spots aren’t marked or set up as official view points, but the shoulder is wider at a few points making it safe to pull over. As you drive towards Lago Machónico, you’ll pass the Mirador Pil Pil and Arroyo Partido viewpoints. Like all the official viewpoints and photo stops, they are well marked 500 meters beforehand, giving you time to slow down. Before reaching the first official lake of the drive, Lago Machónico, you’ll pass the small Laguna Fria. The road then curves to the left before revealing a panoramic view of Lago Machónico. There’s only a viewpoint here, looking down at the lake below. After stopping to stretch your legs and take in the view, continue south to Lago Hermoso. All of my favorite lakes, like Lago Hermoso, weren’t part of the official seven. They all required a short detour off the main highway, which meant more space and less people. The turn off to Lago Hermoso (coming from the north) is on the right, by the El Viejo Almacen restaurant. It’s only 2 kilometers so there’s no excuse not to make the effort. There is another restaurant overlooking the beach that had killer views. It was closed when we were there. I’m not sure if it was due to low season or because we were there too early in the day. There are campgrounds and a shop for handicrafts sold by the indigenous Mapuche people. Back on the main road, head south to Lago Falkner. This was my favorite lake of the official 7 that line the main highway. The road borders Lago Falkner at water level just meters from the beach. There was a food truck and artisanal beer stand right next to the water here. Both were closed, I suspect it’s only open in peak summer months (December to the beginning of March), but we were also there pretty early in the day. There are toilets and changing rooms here as well. Further down from the facilities is a huge beach, right next to the shoulder of the highway! The next lake, Lago Villarino, neighbors Lago Falkner. The road passes right between the two, leading you up to the main viewpoint that looks down on the lake from above. However, there’s a dirt road that leads to the Villarino Campgrounds right on the beach. It’s easily missed so keep an eye for it on your left just as you leave Lago Falkner. Lago Escondido is exactly as the name indicates, hidden. There’s a viewpoint right next to the lake, but you can only see glimpses of it between the trees (above). Despite this, I still thought it was beautiful with its teal green water. This was the biggest detour of our day. The turn off to the town of Villa Traful (above) and the lake of the same name is just before Lago Correntoso. Provincial Road 65 is a dirt road through the forest and it’s a 26 kilometer drive. The road was in good condition but we did have to drive pretty slow. In total we spent a few hours here, having lunch and relaxing on the beach. This was, without a doubt, my favorite part of the day. Lago Traful is gorgeous and the tiny town was sleepy in all the right ways. There were a lot of adorable cabins, campgrounds, and restaurants along the water. If you have the time, consider spending a night or two here. I definitely want to on future trips. While in Villa Traful, you cannot miss the Mirador del Viento. It’s a few kilometers past the town, perched on a cliff looking down on the immensity of Lago Traful below. It’s aptly named as the Windy Viewpoint so hold on to your hat as you step up to the edge of the boardwalk. The photos above are from the viewpoint (on the right) and of the viewpoint from below (on the left). After you’ve had your fill of Lago Traful, wind your way back down RN26 to the pavement of Ruta 40, pavement you never knew you loved so much until you spent 30 kilometers bouncing around on the dirt road to Villa Traful. Shortly after the turn off to Villa Traful, the highway bends sharply to the right. Just after this bend there’s a turn off to a campground on the shore of Lago Correntoso. If you’re looking for a picnic spot, this is an excellent choice. Otherwise, keep driving to the two panoramic viewpoints further down. Another unofficial lake and of course, another favorite of mine. You’ll see the exit for Lago Espejo Chico just after the first mirador/view point for Lago Correntoso. The drive is short, bordering the Ruca Malen River. The river here is just as beautiful as the lake, if not more so. People were laying on the shoreline and even fly fishing (note: do not fish here without a permit). You can’t miss the beach at Espejo Chico as the road leads you straight to it. The are facilities here include a restaurant and campgrounds. We sat on the beach for a while, listening to the water wash up against the rocks. I loved Espejo Chico, don’t miss it! Right after you pull back onto the highway from Espejo Chico, you’ll see another viewpoint for Lago Correntoso. From there, the road continues south, passing the small Lago Bailey Willis to the right before reaching Lago Espejo Grande. There’s a viewpoint looking down on the lake from above. Shortly after Espejo Grande, the large Lago Nahuel Huapi comes into view, marking the end of the Seven Lakes Route. There’s one last panoramic viewpoint right as you’re entering Villa la Angostura. It’s worth stopping, even if you’re tired of all these stops. Nahuel Huapi is enormous and the largest lake in the region. Congratulations, you’ve conquered the Ruta de los 7 Lagos! If time allows, relax with a coffee or drink in Villa la Angostura before continuing on with your day, you deserve it. From here we turned back to drive home to our hotel in San Martin de los Andes. If you’re also driving the seven lakes road “there and back” as we did, don’t worry about being bored on the return journey. The drive was very quick without all of the stops. The best part was seeing everything from a new angle. It honestly felt like a completely different drive. We pulled off the road before reaching San Martin de los Andes to watch the sun drop behind the mountains. The town itself is tucked away behind a hill in a way that puts it in darkness well before sunset. To get the best sunset view, stop a few kilometers outside of town. The shoulder widens here and it’s safe. Plenty of people had the same idea, but we were the only ones drinking wine instead of mate. I’ll take wine over that much caffeine at night any day (but maybe that’s how Argentine’s are awake for such late dinners?). Cheers to an excellent day on the Ruta de los 7 Lagos. I hope you enjoy it as much as we did. All of the lakes on the Ruta de los Siete Lagos have crystal clear, turquoise water. They’re only deep blue due their depth.